Nowadays the small leaved lime (Tilia cordata) is a relatively rare tree in the U.K. but after the last ice age, it was common. Pollen analysis of sediments suggests that small leaved limes were a major component of southern lowland woodlands in the British Isles. Why the species has largely 'disappeared' is not clear; it could be climate change, or perhaps the trees were growing on land most suited or wanted for agriculture and it was simply cut down: or perhaps it was more vulnerable than other species to the grazing of the stock animals of early settlers. Not unsurprisingly, the leaves of the small leaved lime are smaller than those of the broad leaved lime - being about 8cm long and 8 cm in width. 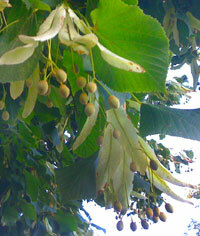 The leaves are also somewhat more symmetrical than those of the broad leaved lime. Sometimes the base of the leaf is described as heart shaped, the tip of the leaf comes to a point. The edge of the leaf or margin has a series of fine 'teeth'; that is, it is finely serrated. 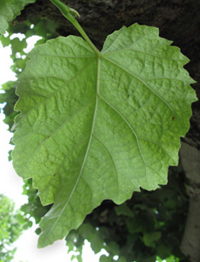 With mature leaves, the upper surface is a dark, shiny green whilst the lower (abaxial) surface is paler and there may be 'red / brown' hairs in the axils (angles) of the veins. Each leaf has a distinct stalk or petiole, which can be up to 4 cm long. 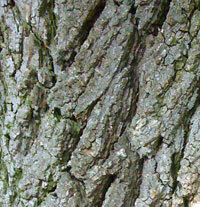 The bark is sometimes described as grey or buff. certainly, it has a greyish appearance on young twigs / stems but becomes darker and cracked on older trees, or may be a bit flaky. It is generally rougher and craggier than that of the broad leaved lime. Buds are ovoid, 'fat', red and hairless. Each bud has one large and one small scale leaf. Scale leaves protect the innermost delicate structures throughout the vagaries of the winter months. The shoots may develop a reddish tinge in the sun / light on the upper surface. Young trees have a neat. 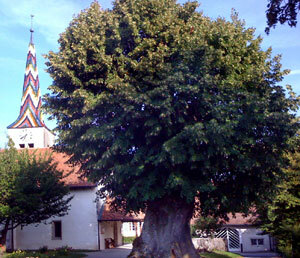 conical shape but as they mature the branches cross and mingle. On the Continent, the trees can reach a height of 80 feet but tend to be smaller in the U.K.
Yellow insect pollinated flowers are produced in July. These fragrant flowers may be used to make an infusion (TILLEUL] in France, not dis-similar to Camomile here. The flowers may be profuse and cover the canopy of the tree at the time of flowering so that the crown is a creamy yellow colour. Each flower has five sepals and five petals; they occur in clusters (up to 10 together) suspended from a green bract. The bract is a long (may be 10cm), narrow leaf like structure. The flower stalk of the flower attaches to the mid-rib of the bract. The flower stalks are bit stiffer than those of the broad leaved lime flowers. After fertilisation, a one seeded fruit forms. This is round and hard (about 6mm in diameter). The buds are arranged in an alternate fashion (this can give the twig a zig zag shape), are about 4mm in length. Their surface is smooth and a dark red colour. The twigs may arch downwards, have a red colour on the upper surface and are olive greeen on the lower / shaded surface.